Sorry for the break girls! But my router has burned down and I will not have a new one until tuesday(!!!). Well, fortunately I have some great outfit photos up my sleeve, these are obviously from before the snow melted away. I love how light and nice it looks when the snow is covering every surface. And my sneakers were surprisingly warm, if you haven’t seen it on instagram they were Victors christmas gift for me. I can’t wait to wear them around for the fashion weeks! Only one month until it starts in Copenhagen! Photos taken before the snow arrived! Jesus it’s bright out there suddenly. When the weather was grey I decided to wear pastels (underneath a coat, for the record). I just received this dress which has been on my wishlist and my potential NYE-dress. What do you think? It took me a while, but I’m head over heels in love with overalls/dungarees. I’ve always known them as overalls, but suddenly they are called dungarees everywhere. Can you explain? I wanted to style them up, or else I literally looks like a farmers girl! So I wore my fancy jacket and spiced it up with my new sale treasure, the minimalistic sandal. Had a great day, starting of with a blogger brunch at Royal Smushi for Hunkemöller, following coffee at Shoeshibar’s showroom. Then a few hours school before heading of to work. Jones will be shooting my final collection today, I can’t wait! 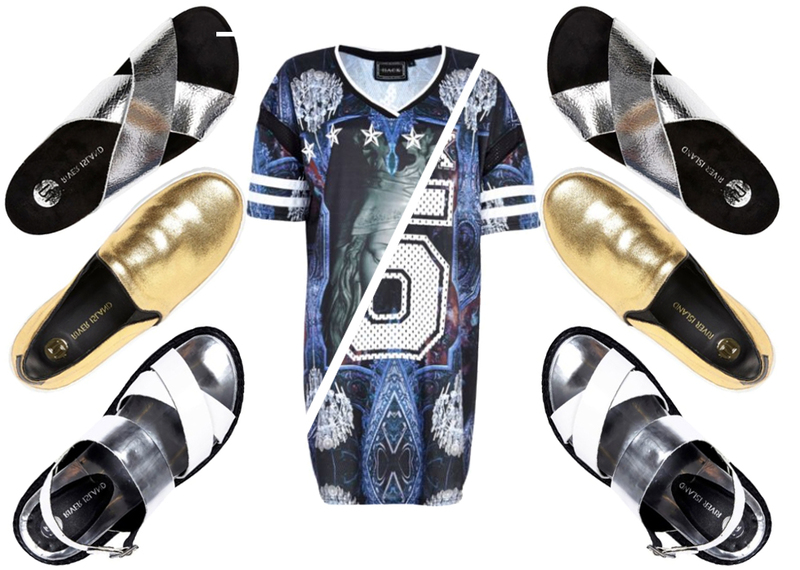 Currently craving metallic shoes and oversize basket tee’s. Perfect with a little nike sock, just like Sarah‘s. What do you think? I tried to show both the print back and front on the dress, but make sure to check it out to see the entire cool print!